Freshwater wetlands are considered to be one of the most important natural resources. They provide food, fuel, store and filter water, buffer against flooding and, store carbon. Wetlands are also important sites of recreation, allowing people to get in touch with nature. They also preserve important archaeological records such as organic materials and paleo-environmental deposits. Over the past 1000 years, wetland habitats have been drained, developed on or polluted leading to a 90% loss of wetland area. Over the past 50 years, more than 100,000 wetland archaeological sites have also been damaged or lost. 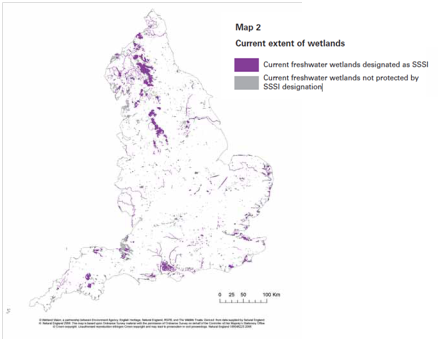 The dramatic loss of wetlands can be seen in the below maps. As a consequence of habitat loss, wildlife and ecosystem services have declined or been lost. 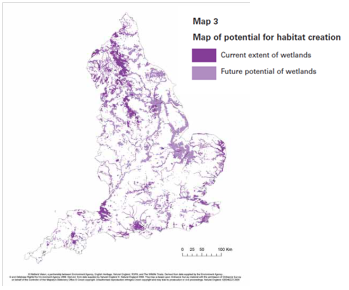 The majority of fragmented and diminished wetlands currently within the UK’s are also in poor condition. 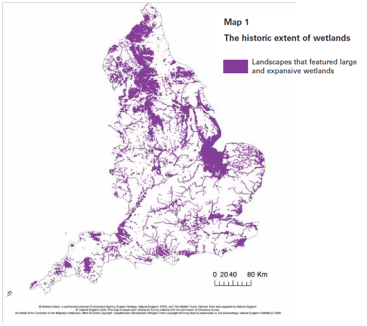 In 2008 English Heritage, the Environment Agency, Natural England, the RSPB and the Wildlife Trust published “A 50-year vision for wetlands”. This document outlines the aims and objectives these organisations wish to achieve in order to preserve, enhance and restore England’s wetlands to maintain wildlife and historic records whilst benefiting society. Locations where this is considered possible are shown in map 3. To achieve this vision, regional support is needed as local knowledge and thoughts are vital for the success of such large aims. The Fens were once England’s largest wetland, but over 97% of wetland habitats have been lost within the region. Therefore, a great deal of effort is needed to maintain surviving sites and restore others. 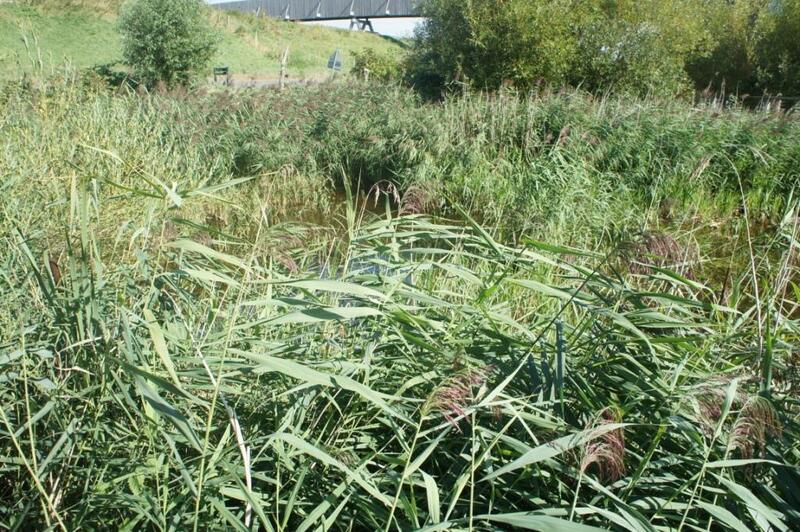 This is already being put into practice through projects such as the Hanson-RSPB wetland project at Ouse Fen which will not only benefit the area but also contribute considerably to the Wetland Vision’s desire to double the area of reedbeds in England. Additional local involvement will be achieved through the Fens for the Future Partnership. Their strategic plan will ensure that “the visions for wetlands” is implemented within this region through its own targets. The Great Ouse Wetland network is one of the UK’s most important wetlands at 3,000ha. 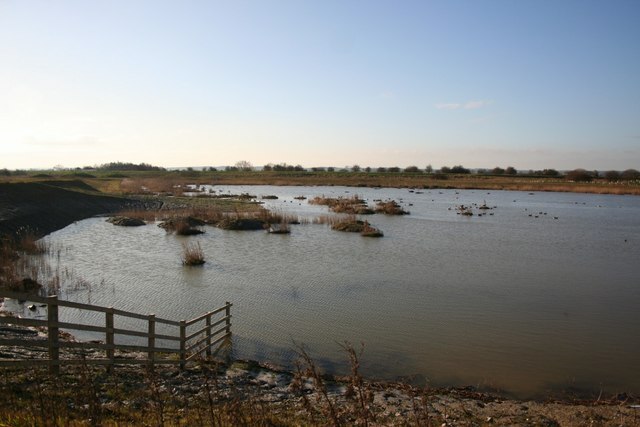 The area is comprised of a network of wetland nature reserves including the well-established Welney and Ouse Washes nature reserves, and newer reserves such as Fen Drayton Lakes and Ouse Fen, as well as planned schemes at Sutton and Coveney. These sites are mostly owned by nature conservation organisations including the RSPB, WWT and WTBCN. The Ouse Washes Landscape Partnership will further work on these aims as the scheme looks to encourage the local community to take part in conservation through projects such as “Giving Nature a Home at Fen Drayton”, “The Great Ouse Wetland Engagement project” and the “Barn Owl Recovery project” which will all be implemented with our partner organisations as part of the scheme’s delivery phase, which starts in 2014. The Ouse Washes Landscape Partnership will play an important role in preserving and enhancing ecosystem services within the Ouse Washes. In 2005, the Millennium Ecosystem Assessment thrust the concept of ecosystem services in to the political, scientific and social arenas. However, to understand why ecosystems services are important, it is important to understand what they are. 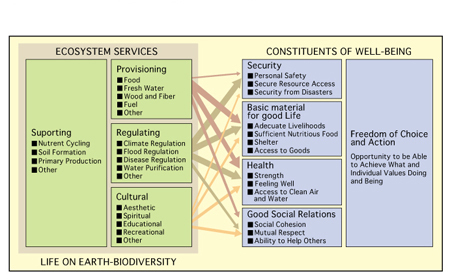 The linkages between ecosystem services. Ecosystem services are defined as “the benefits people obtain from ecosystems”. Ecosystems, a combination of living and no living elements within a community, are all around us. Therefore, it is important that we understand how nature works to advantage us. There are four different groups of ecosystem services which provide different types of benefits. The services that have physical benefits that are easily seen such as food, water, wood and fuel are known as provisioning ecosystem services. The production of these rely on supporting ecosystem services such as nutrient cycling, soil formation and photosynthesis. Even if an ecosystem has healthy supporting ecosystem services, regulating services such as pollination, water purification and, climate regulation are required to guarantee the production of provisioning ecosystem services. To further benefit from all of the above, ecosystems provide cultural services such as aesthetic, spiritual, educational and recreational benefits. Due to the benefits they provide, it is now recognised that ecosystems have an economic value as services such as food and water have a market value. Work is currently being conducted to attempt to assign economic values to all ecosystem services. It is also important to note that ecosystems also have dis-services. These are services that are disadvantageous to the ecosystem within which they reside. For example, flooding or crop pests could be considered as dis-services. However, dis-services can be kept at bay by ensuring that ecosystem services are well managed thus, problems can be overcome. For example, flooding can be managed through effective landscape management that alters regulating services such as water purification through wetlands as the water is stored in a different area. Wetlands are essential for water regulation, archaeological preservation and species habitat. The Ouse Washes contains wetlands that are extremely important. They are recognised both nationally and internationally as ecologically important leading to its designation as a Special Area of Conservation, Special Protection Area and Ramsar, with additional sites being recognised as Sites of Special Scientific Interest. The Ouse Washes area provides numerous ecosystem services both within the proposed area for the landscape partnership and beyond the boundaries (table below); therefore it is extremely important to manage this landscape to continue to enhance its existing services and to reduce the likelihood of dis-services arising. The OWLP scheme themes (https://ousewasheslps.wordpress.com/2013/05/21/proudly-presenting-our-themes/) will address the above services by establishing and delivering projects working with other organisations. Whilst all of the above is fairly technical, the take home message is that nature provides for us. Without it, we would have nothing. Therefore, it is important to learn to look after our landscape and our heritage both of which the OWLP scheme aims to do. Wetlands are an important habitat for ecosystem services.